I really love my Time Keeper. There are two things I do to make it even more user-friendly for me. I suppose I could suggest these to its creator, but they seem like the kind of thing not everyone would like. 1. I snip the corners as I go, so I can easily find my place. 2. 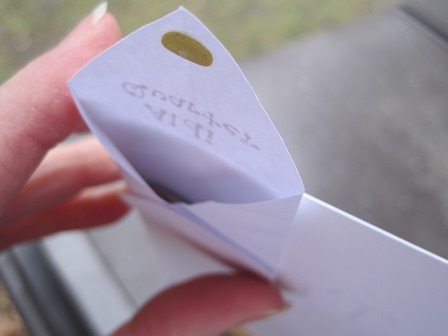 And I create a little envelope for my Aldi quarter, and glue it inside the front flyleaf. You have no idea how hard it is for me to keep an Aldi quarter on hand. Those of you who shop at Aldi know this: you have to put a quarter in the cart before you take it, your little pledge to return the cart (and reclaim your quarter) so as not leave it out in the parking lot. They are uber-smart, these German grocers. I’ve been watching and researching their business policies, and I have to say I’m impressed. But I digress. You would think it would be easy to keep a quarter tucked in the van for such a time as this. You would think. In fact a quarter is often in demand, for parking meters in town or for slot machines that dispense candy to children who have been good while shopping. (Did I say that out loud?) The quarter grows wings. For a long time, God and I had a little game going in which I forgot my Aldi quarter and He came up with creative ways to supply it. This amused and inspired me for a long time, until I thought how irresponsible I was being and started carrying one with me. Once I was driving to town and God nudged me in the middle of me thinkingaboutsomethingelse. How about that Aldi quarter? Oh NOO, I’d forgotten again! This one’s going to be good, He said. And then I looked underneath. There was a large cardboard box getting smooshed between her cart and the next one. But it also made me feel kind of like a taker, especially after I witnessed The String Cheese Incident, which has nothing to do with the Time Keeper and does not belong in this post. I will tell it to you next time, I think… Should I do it before or after I host a giveaway for the prettiest object this blog has ever seen?? Now I tuck my quarter in that little envelope and do not pull it out except in the parking lot of Aldi. I always have my planner along in town, because that is where my shopping list lives. So. Am I quenching the Spirit in creating a little pocket of security, or am I presuming on His grace to be careless about carrying what I know I will need? How do you modify your planner? I just asked you three questions. They are important, and you may answer them all. I use a large, colorful paper clip to keep my place in The Time Keeper. 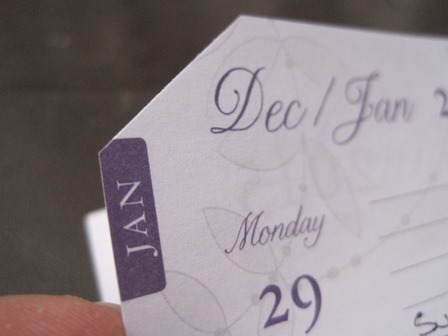 One side of the clip is at the monthly calendar page, the other is on the current week. Another paper clip resides toward the back of the planner, at the grocery list. I always forget my shopping bags for Aldi. Always. 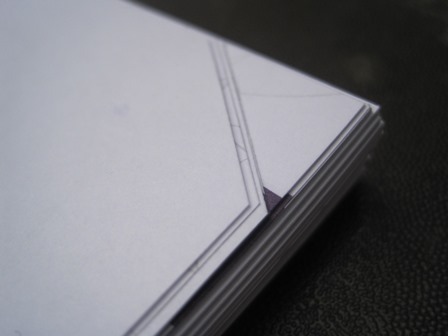 Is there any magical way to fold THEM into my planner? 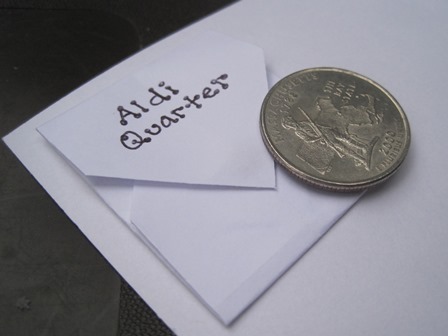 And The Aldi Quarter! A few weeks ago, I approached Aldi with a huge shopping list and a quarter-less wallet (and van!) I was praying to meet an understanding person who would trade my two dimes & a nickel for their quarter. Instead, I found that some KIND SOUL had left a quarter in every available cart! What a blessing! Now I do the same if I have extra quarters. I too love the timekeeper …it’s been helping me keep my head about me for years! I know what you mean about the quarter business! How many times have I rummaged through the van, breathing a prayer, and let out a shriek upon finding. Your idea sounds smart! Ah, I love the planner ideas and the quarter stories, although I guess God loves me in other ways since I’ve forgotten my quarters and haven’t been so fortunate! Giveaway first, please… but oh, I do want to hear bout cheese! My thought on your second question is that perhaps God gave you one last help in the quarter department by giving you a swell idea of helping yourself with the cool little envelope. Now since you are aware of so much, you would be asking too much to show up quarter-less again! I bet He’s moving on to show Himself in another area to keep you on your toes. Look for it and let us know! I always wondered why trains and buses waited for certain people when they were running late? I had one friend flag a train down and they waited for her to board. It never worked that way for me. We need to share our stories. Thank you for yours. I’m interested in your other question as well. I put a tab at the beginning of each month. It makes easier when I note an event, prayer request, etc., in advance. I know Starla, the one who designed the planner), so I e-mailed her the suggestion of having the planner come with ready-made tabs. She replied that she had considered it, but it would have added considerably to the cost, so she decided against it. This makes me smile, LRM! you’ve convinced me to invest in Time Keeper!!! I want the give away AND the cheese story both within the next 24 hours. Love the idea of the quarter envelope! I NEVER seem to find a quarter or remember to take one & usually end up carrying 2 cardboard boxes full to overflowing (or overdumping) around and feeling like a weirdo not to mention the VERY sore, weak arms till I make it to the line up front!! Thanks for the tip!! I don’t have a timekeeper either…I buy el-cheapo school planner and need to replace it at the end of July. String cheese first! There is a little compartment in the drivers door of our van, you know, up there by the window opener thingy and the locker button, yes, that little dip in the vinyl there. I pop a quarter in there, and try hard to keep it there, for the Aldi cart. Then I accidentally use it to finish buying a coffee…than sternly remind myself to practice discipline and keep it for carts, and carts alone. Another brilliant move my sister pointed out to me, was to just drive the whole disheveled load of groceries out to the van, firmly buckle everyone into carseats, and than bag your groceries in peace. For many moons, I desperately tried to hold the cart in place with one foot, the baby in the front seat with one arm, and bag with the other arm that was also rescuing loaves of bread and chips from the toddler. Just drive the whole caboodle to the van. Even in snow, it’s worth it. Yes!! I’ve done this too but gave up on it in bad weather. I love the “firmly buckle” bit. 🙂 Yep, that’s what it takes. And the “I accidentally use it.” You always make me smile. At the risk of sounding snooty, which I don’t mean to be :), my Day Planner already has it set up to snip the the weeks to keep better track. It isn’t perforated though, so I still need to get a scissors or just rip it. The Aldis quarter– I have no magic. I try to keep one in my wallet always and beings my daughter is a little too young to beg for candy and I rarely use change for anything, it mostly works. Also, we live 45 minutes to an hour from Aldis so you kind of plan ahead to go there. I have discovered the beauty of 31 bags (thanks to a sister-in-law consultant) that makes the grocery carrying aspect quite nice, but it does still require you to somehow remember those bags when leaving the house. I have felt a little ridiculous already leaving Aldis with arms full to overflowing. It makes me feel a little like I’m stealing to walk out of the store with unbagged groceries. Considering the box being squished between the carts from the poor frustrated lady’s perspective, are my frustrations sometimes God’s work of blessing in another’s life? Am I ok with that and do I pass on the “quarter” or determinedly force the situation and horde what I consider mine? Thank you for a good heart searching retelling.